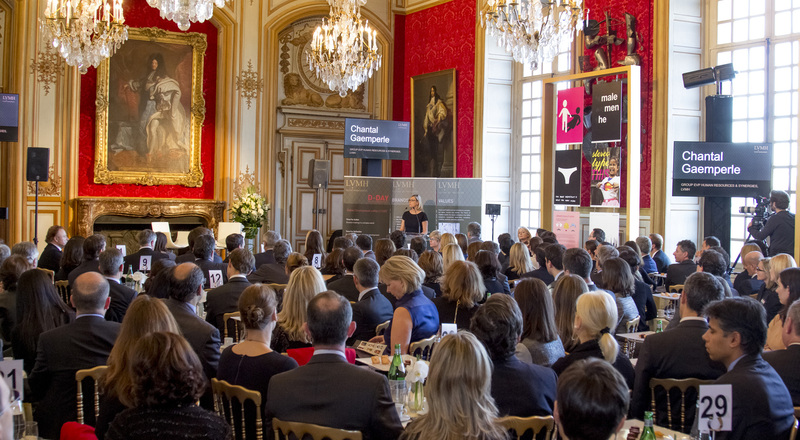 On November 13, LVMH is hosting a day-long event dedicated to talent development for 150 senior and high-potential executives at the Hôtel National des Invalides in Paris. Organized at the initiative of Chantal Gaemperle, Group Executive Vice President, Human Resources and Synergies, the event will focus on success factors in a Group whose culture of creativity and entrepreneurial drive creates uniquely rich career opportunities. The agenda will cover four dimensions that underpin fulfilling long-term careers: expression of ambition, self-marketing, international and dual career, and work/life balance. Each of these dimensions will also be addressed by guest speakers, who will offer input from the perspective of their own successful careers: Anne-Sophie Pic (Chef of Maison Pic in Valence and the only female chef in France to hold three stars in the Michelin Guide), Yi Zhou (Shanghai based multimedia artist and “idea agitator”) and Claire Chazal (journalist and writer). The meeting will end with an official ceremony during which LVMH and 30 Group Houses will sign the United Nations Women’s Empowerment Principles. The Houses signing the Principles are: Krug, Moët & Chandon, Hennessy, Veuve Clicquot, Glenmorangie, Estates & Wines, Louis Vuitton, Fendi, Emilio Pucci, Marc Jacobs, Berluti, Christian Dior, Loewe, LVMH Fragrance Brands, Givenchy, Acqua di Parma, Kenzo, Thomas Pink, Parfums Christian Dior, Guerlain, Parfums Loewe, Make Up For Ever, TAG Heuer, Fred, Chaumet, Dior Montres, Bulgari, De Beers Diamond Jewellers, Sephora, Le Bon Marché, DFS, Les Echos and Le Jardin d’Acclimatation. This public engagement underlines the importance accorded to talent, especially women executives, and a strong commitment to provide both female and male staff with an international ecosystem guided by excellence where they can reach their full potential. “LVMH counts more than 110,000 employees who work in a tremendously stimulating and demanding environment. Our culture of creativity leads us to devise innovative approaches to ensure continuous development of talented people throughout their careers with the LVMH Group” says Chantal Gaemperle.